Do you have cracks in your foundation walls? Have you noticed bowing, buckling walls that aren't stable any longer? 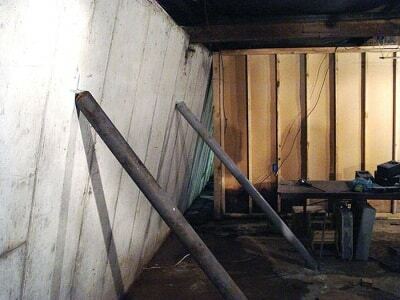 If so, you need a foundation wall repair system from Total Foundation Solutions. We provide a variety of options to fit your specific needs and restore your walls to a safe, stable condition. Weakened foundation walls can have a significant impact on your home's stability and value, and it's essential to address these problems quickly and effectively. As experienced foundation repair contractors, we know how to restore your home to proper condition. Call us today at 814-208-9442 or click below to learn more about how we can help you. We offer free estimates in Erie, Edinboro, Warren and throughout the surrounding areas. Protect your foundation. Your foundation is too important to take risks with, which is why we provide complete repair and stabilization solutions. The CarbonArmor® Wall Reinforcing System is a state-of-the-art solution for bowing and cracking foundation walls. 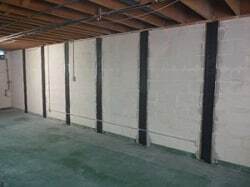 Using the same technology the Army Corps of Engineers developed to reinforce bomb shelters, skyscrapers, and bridges, we use CarbonArmor® to stabilize your basement walls. The CarbonArmor® System includes flexible carbon fiber fabric straps that are up to 10 times stronger in tension than steel. Using high strength epoxy resin, the carbon fiber straps are bonded to the interior face of the wall. The straps will stabilize the wall. This system requires no exterior excavation, installs quickly, and won't impact future basement finishing. The PowerBrace™ Wall Repair System is the ideal way to stabilize failing foundation walls. If you have walls that are bowing, buckling, or tilting inwards, installing a PowerBrace™ system can stop any further damage and potentially straighten the wall. The PowerBrace™ consists of steel I-beams that are secured to the joists above the wall with steel brackets. This system is easily adjustable, allowing for tightening of the brace to attempt to raise the wall back to its original position. This system doesn't involve any exterior excavation and installs quickly with minimal disruption to your basement space. GeoLock® Wall Anchors are designed to repair walls that are sliding inwards, tilting at the top, bowing, and buckling. These wall anchors are made of galvanized steel for a long-lasting solution that will prevent any further inward movement of your walls. Wall anchors work by extending from your wall to the stable, hard packed soil beyond your home. They anchor into these stronger soils and brace the foundation wall, preventing further movement. Wall anchors are installed with minimal disruption to your lawn, and they won't damage the interior of your basement or take up usable space. In fact, GeoLock® Wall Anchors can easily be concealed by our Hide-A-Way® covers for a clean finished appearance. "Street creep" is a phenomenon where thermal expansion of pavement surrounding a home pushes against the foundation and creates problems such as bowing walls. 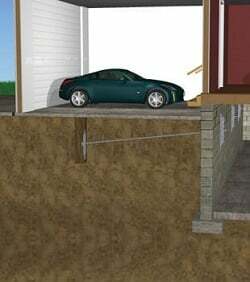 The GeoLock® Street Creep System is designed to eliminate inward movement and stabilize your foundation walls against the pressure created by your street, driveway, and garage slab. This system works by first creating expansion joints in the driveway that allow individual slabs to expand and contract without damaging other ones. These joints are filled with a resilient backer rod and a durable, flexible polyurethane sealant. 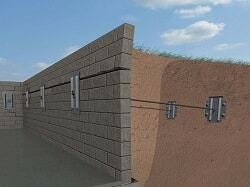 Next, GeoLock® Wall Anchors are installed to stabilize the walls in competent soils and potentially straighten the wall. All holes created for installation are then repaired. With this system installed, you won't have to worry about additional movement creating problems for your foundation walls. GeoLock® Channel Anchors are a versatile and effective method of stabilizing walls that are pushing in at the top or bottom, bowing, or tipping. 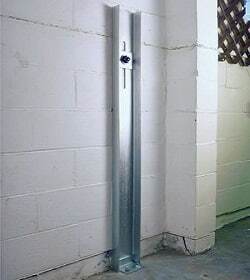 With corrosion-resistant galvanized steel and floor mounts for extra strength, our channel anchors provide an incredible durable solution that will halt all inward movement of your walls. To install channel anchors, we begin by boring holes in the yard for earth anchors and drilling corresponding holes in the foundation. 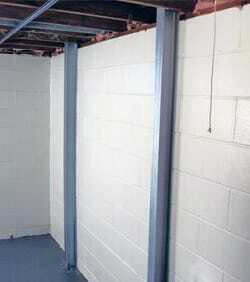 Galvanized steel earth anchors are installed and steel rods are joined to them through the wall. The channel anchor is then mounted on the other end of the rod inside your foundation wall, secured to the floor, and tightened into place. This will permanently stabilize your wall and could return it to its original condition. After this, we restore your landscaping and basement to the state we found them in. If you have issues with bowing, buckling, or cracked foundation walls, Total Foundation Solutions has the solutions you need to stabilize your home's foundation. Our experienced foundation professionals will carefully evaluate your home and work with you to determine the best solution for your needs. If you're interested in foundation wall repair services, give us a call today at 814-208-9442 or contact us online to get started with a free estimate. We offer all our foundation repair products in Erie, Edinboro, Warren, Fredonia, Meadville, Olean, Jamestown, Harborcreek, Hermitage, Du Bois and throughout the surrounding areas.